This post is going to be part of a series on Xfce, originally posted on my university blog. I’m republishing them here in the hopes that others might find them useful or interesting. Cheers! You may have noticed a few weeks ago I announced that I was moving my primary machine over to GNOME from KDE, mostly because the applications I use most heavily on FreeBSD and GNU/Linux are all GTK+ based and it seemed silly to run them in a Qt system. I'm a sucker for eye candy and visual consistency. Well here I am now typing this on my newly reinstalled FreeBSD, Xfce desktop and it's running great. You can be forgiven if you're new to the world of Linux, BSD and X11 in general if you've never heard of Xfce; it certainty has been given far less publicity than the heavyweights GNOME and KDE despite it actually being born around the same time. 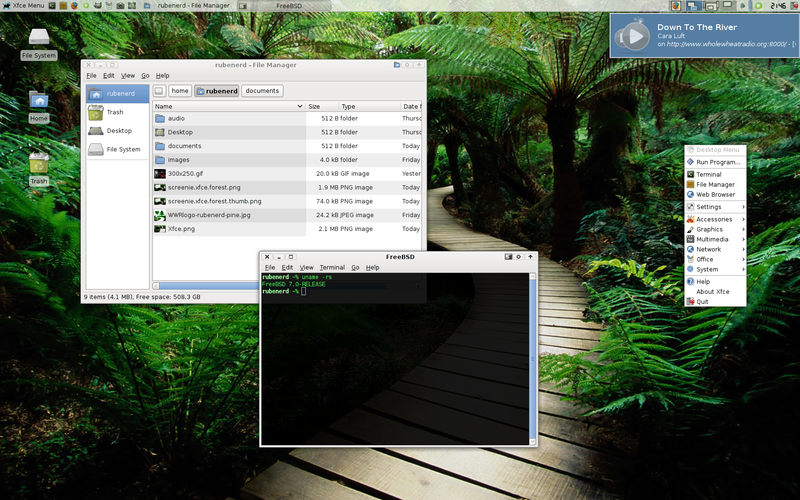 Unlike GNOME and KDE which strive to be the ultimate desktops with all the bells and whistles, Xfce is designed to be lightweight and fast while still being a usable and complete desktop environment out of the box (as it were). This means unlike vanilla window managers such as Fluxbox it also includes a file manager, desktop background and icon support, graphical configuration, panels and so forth. A full list of included goodies is maintained on the Xfce projects site. The real kicker for me is that as with GNOME, Xfce uses GTK+, meaning all my most used applications such as Gnumeric, Abiword, Mozilla Firefox, The Gimp, Inkscape, Thunderbird and the X11 version of VIM all look really slick and match the rest of the system. I'm a sucker for eye candy and visual consistency. Wait, I already said that. In the coming days I'll be posting many more entries about my experiences with Xfce including how I've customised and used it and some other tidbits I've picked up along the way. Stay tuned :-).